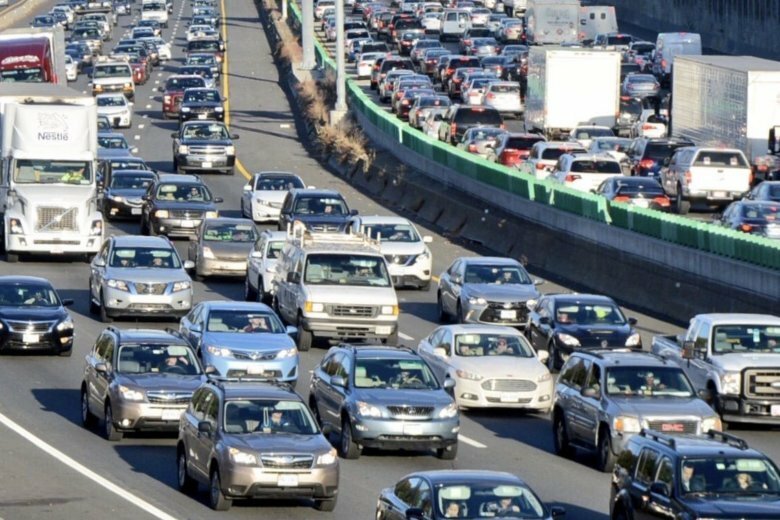 Already gridlocked, the D.C. area is expected to grow significantly over the next 25 years. But transportation planners say there are ways to keep traffic moving. The D.C. area is expected to grow significantly over the next 25 years, but transportation planners say traffic and congestion don’t have to get exponentially worse with the proper placement of new jobs and housing. Projected growth in daily vehicle hours of delay could be held down by about 20% between now and 2045, if area governments add new housing near transit and activity centers, the Metropolitan Washington Council of Governments’ director of transportation planning Kanti Srikanth said. There’s also the potential to reduce vehicle miles traveled by everyone in the region by about 3%, which Srikanth said is significant when you’re talking about 160 million miles traveled. “There is regional acceptance on the idea that we need to balance jobs and housing and we need to have housing around high-capacity transit stations because those are investments we’ve already made. And, we need more housing in regional activity centers,” Srikanth said. While the idea is accepted by local leaders, Srikanth said there are three big challenges to making it happen: policy impediments, community dynamics and market forces. “We, as a region, need to figure out, how do we work on all of those three to make this happen,” Srikanth said. Challenges related to market forces include the types of housing that is needed versus the types of housing that is being built, housing prices needing to be affordable for the workforce and housing locations. Community dynamics, which is similar to the NIMBY — “not in my backyard” — philosophy, is when current residents resist density, development or new residents they feel might spoil their quality of life. Holding down growth in traffic congestion and delays with housing strategies is one of five initiatives COG’s Transportation Planning Board recommends to help keep the area moving. For example, Maryland is moving forward with plans for express lanes on Interstates 495 and 270 and endorses Bus Rapid Transit (BRT). “Montgomery County has just announced five BRT projects they intend to build in the next 20 years. They’ve already gotten some federal funding for it,” Srikanth said. And, Fairfax County is developing Bus Rapid Transit for Richmond Highway. Also recommended are light rail and street cars. Metro could enhance capacity by running more of the longer, eight-car trains. But, the challenge with that is some stations don’t have capacity for boosts in ridership and some platforms aren’t long enough for longer trains. Other ways to keep cars parked is to offer employees transit subsidies so they won’t drive or get more people to telework. Currently about 12% to 13% of workers in the region telework about 1.5 days a week. Srikanth would like to double that number so 20% of workers on any given day are teleworking.